Who doesn’t love a good infographic? 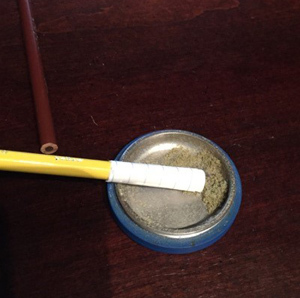 This is a simple step-by-step guide that’ll have you packing mini nugs in no time. As always be careful. 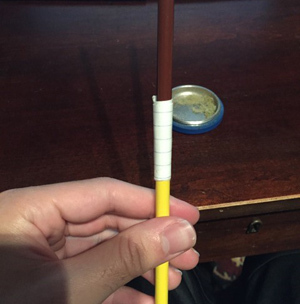 Make sure the pen has a metal tip and be careful not to burn the plastic. Consuming cannabis orally is one of the most effective ways to benefit from its medicinal properties. In contrast to smoking or vaping where a majority of cannabinoids remain unabsorbed by the lungs, edibles allow the body to absorb ~95% of all active cannabinoids which allows for less material to be used to achieve the desired effects. While there are many different edibles available in all kind of forms and flavors, there’s no denying the simple medicinal qualities of a tasteless, odorless hash oil capsule. Hash oil capsules are essentially that– cellulose/gelatin capsules filled with a measured quantity activated hash oil. These pills offer the most simple, medicinal approach to edibles as they don’t require refrigeration, have more consistent potency and are easier to dose than traditional baked edibles (they also tend to be hypo-allergenic). A capsule “filling machine” or holder to hold your capsules in place while you fill them, should be available where you find the gel caps. Similar to our cannabutter tutorial, you need to activate the THC (via decarboxylation) before it will be effective orally. All you have to do is combine the coconut oil and cannabis in your crock pot and heat it around 220°F for between one and two hours. If you don’t have a crock pot, you can just add the ingredients to a metal bowl and carefully immerse the bottom of that into a pot of boiling water for the same amount of time; water boils at ~212°F which is an optimal temperature to decarboxylate over about an hour and a half. Some people opt to use cheesecloth when using ground bud in order to strain the final product but I’ve found this to be an unnecessarily messy step that has little to no benefit on the final product and may actually adversely affect potency. Once your oil has been properly decarboxylated, all one needs to do is set up some open capsules in the capsule filler/holder and use the syringe to fill the capsules with anywhere between .05g and .1g of hash oil. These capsules can be very potent so be careful when trying them for the first time, if you find you’ve made them too potent simply dilute with more coconut oil and re-cap. With edibles, less is more (one can always have a second or third) so you may want to start with approximately 1g of hash or kief (2g of bud) for every 2 teaspoons of coconut oil and adjust to preference from there. Get Medicated While some people get fancy with additives like soy lecithin, this recipe offers the most basic, simple, effective method for creating your own odorless, flavorless hash oil capsules. Remember that it’s always best to eat something before taking hash oil capsules to stimulate the digestive tract and be sure to wait an hour or so after trying one to determine if you’re medicated enough… these capsules can creep up on you pretty hard! Although there is often a debate concerning the various methods of seasoning your dab nail, some methods work better than others. My opinion has always been to take a natural and balanced approach. Simply by using your titanium nail at low temperatures can build a natural seasoned layer, which serves not only as a protection against oxidation, but also as a way of enhancing the flavor of your medicated concentrates upon inhalation. By applying extracts at mild temperatures between (275-350 degrees Fahrenheit) you’ll be able to create an even, more balanced layer compared to extracts exposed to a higher heating intensity. Less is better in some cases. Dabbing large amounts of concentrates in one hit on an extremely hot titanium nail causes your dabs to vaporize instead of season. This is an important concept to retain while using dabs, especially when butane and propane lighters are involved. Borosilicate’s conductivity value is 1.14 W/(Mk), quartz’s value is 1.3W/(Mk) and pure titanium is 21.9 W/(MK). It’s easy to assume that titanium nails have a better retention to heat than borosilicate and quartz based on these numbers; however, this is simply not the case. Titanium can heat up your dabs much faster but they do not retain more heat. Case in point. If you heat titanium for thirty seconds using a butane torch and then heat a glass nail using the same method for the same amount of time, titanium will get much faster. The reason being isn’t because the glass couldn’t retain heat, but because the glass wasn’t heated for a long enough time, due to its low thermal conductivity value compared to that of titanium. As a good rule of thumb, and based on thermal conductivity alone, it’s safe to say that titanium has a higher thermal conductivity than glass or quartz but not a better retainer of heat. According to certain scientific sources, it’s ideal for titanium to be cooled just below its Leidenfrost point. Just in case you’re not familiar with scientific terminology, the Leidenfrost point refers to the lowest point that vaporization can occur on a surface, allowing for the entirety of that surface to be covered with vapor. Studies have indicated that water’s Leidenfrost point is approximately 339.8 degrees F on polished surfaces and 504.F on rough surfaces. Based on this info, we can conclude that a brand new titanium nail can be heated for about 20-25 seconds until it’s about 25% red hot. 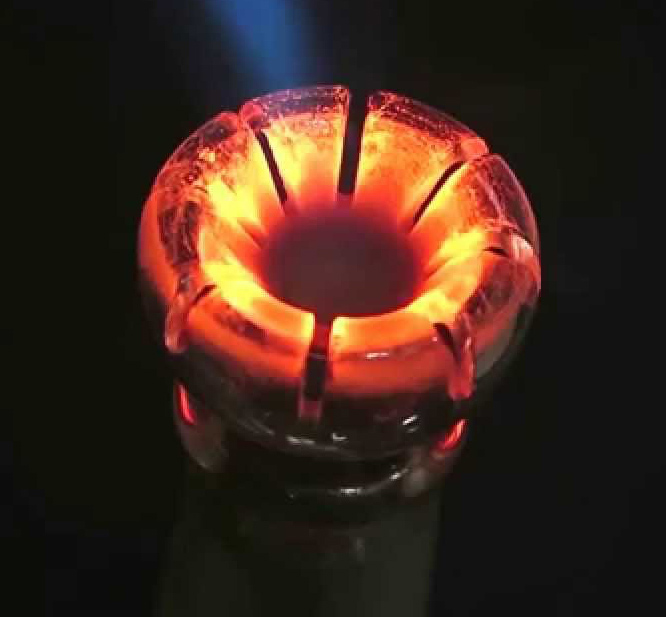 Applying dabs to a nail that’s between 350-400 degrees is the ideal temp for keeping flavor and under the temperature of releasing titanium oxide gas. It’s inevitable– dab rigs get gunked up after sufficient use and at some point down the road, every glass-owner needs to learn how to effectively clean their setup. A dirty piece not only looks and smells bad, it affects flavor and can potentially reduce the amount of vapor actually inhaled. Though there are several products marketed specifically for cleaning pipes, the best method is to use a safe, inexpensive polar organic solvent. The nail is the easiest part of the rig to clean but can be difficult to remove as the glass from your rig may have expanded into the nail creating a tight seal. Just lightly heat the nail at the base and gripping from the top using tongs (or better, forceps if you can find them) gently twist the nail loose. Glass and ceramic nails need only be lightly heated (enough to liquify any offending resin) and wiped with a cotton swab. Titanium nails can be placed on a heat resistant surface (like stone or tile) and heated until glowing red which will carbonize any residue (like a cast iron skillet) and cause excess to flake away upon cooling (you might observe an attractive blue tint to the excess carbon). Once your nail is hot, be sure to carefully use a cotton swab to clean the underside where the nail makes contact with your rig. Do not use your bare hands to hold the nail at point during the process… trust me, it’s hot (personal experience). Regardless of how complicated your rig is, the two best solvents for cleaning glass are Acetone and Isopropyl Alcohol. Acetone can be purchased at the drugstore as clear “nail polish remover” and works almost instantaneously (it’s what chemists use to clean their glassware in the lab) but it smells and shouldn’t be dumped down the drain. Additionally, most nail polish contains “denatonium benzoate” which leaves a residue and is unpleasantly bitter when present even in a few ppm (parts per million) so additional washing with soap and water may be required. Isopropyl alcohol, while not as vigorous a cleaner as acetone, can also be found at the drugstore as pure as 91% and makes for a great solvent which is very rarely tainted with bitterants like denatonium benzoate (though drinking isopropyl will definitely make you feel terrible). Simply pour it in your rig, shake and wait. A soaked cotton swab can be used for trouble areas. If your rig has particularly bad build up in a hard-to-reach spot, a little salt can be used as an agitator in addition to alcohol but in those situations it’s almost always more effective to resort to acetone (with a thorough wash afterwards). Basically, isopropyl is for regular grime, acetone is for when you’ve been particularly neglectful. To finish up, let the solvent evaporate and then do a final rinse with water. If you rinse with water before all the acetone/isopropyl has evaporated, you may end up with while scaling on the sides from precipitate in the water. To remedy, just rinse with solvent and let it dry completely before rinsing with water again. Once you’re taking a dab from your freshly cleaned piece, you’ll probably want life to be that way all the time (this is understandable). Though it may take a little training, its important to remember that regular maintenance goes a long way towards keeping your rig clean. Change the water every time you sesh and try not to let your rig develop a solid layer of slime in between cleanings. 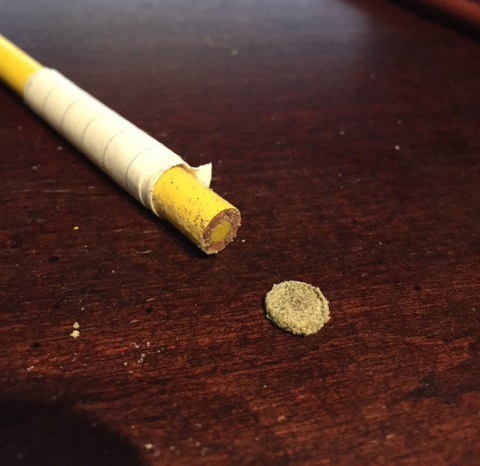 Remember, dabbing isn’t like smoking– all that resin inside your rig is decarboxylated, re-condensed hash oil that didn’t make it into your lungs. A clean rig develops less build-up! If you are ready to upgrade your rig, or would like to add another dab rig to your collection, take a look at these dab rigs for cheap. Nectar collectors for the most part, have only been around for the past year or so, but are starting to gain popularity as more and more people discover this new dynamic method of vaporizing dabs. This new style of dabbing, takes user experience to the next level, by offering a unique vertical vaporizing process that allows you to gauge your dab intake perfectly every time, without having to worry about excess concentrates being wasted during your hits. Most nectar collectors on the market today are relatively expensive, ranging in price from $100, of upwards to $1,000, depending on what brand name you buy and which dab accessories come with them. If you’re lucky, you might come across a low priced, yet highly effective nectar collector from an online wholesale smoke shop, but for the most part, they tend to be on the costly side. At first glance, the nectar collector looks like a probing device from an alien spaceship. The glass body is shaped like a syringe and usually features an embedded percolator, that can be used as a filtration device when water is applied. Accompanying the base are a glass mouthpiece that slides into the top, and a nectar collector titanium tip, that is used unconventionally, as a dab nail. Some nectar collector kits also come equipped with a wax dish, such as this one, that is used as a launch pad, for inserting the titanium tip into finely extracted medical concentrates upon inhalation. The more high end nectar collectors typically come with a rotating metal pivoting stand, that assists in the vertical vaporizing process, once inserted into dabs. Tip #1: Fill the base slowly with water, making sure that it filled about halfway, allowing for the best percolation. Tip #2: Make sure that the glass mouthpiece and titanium tip are removed before filling with water so that water won’t get trapped in the tip. Tip: Make sure water level is a little less than half-way full to allow for optimal percolation. Tip: A small amount of joint wax can be applied to the base in order to prevent the mouthpiece from sliding in place during use. 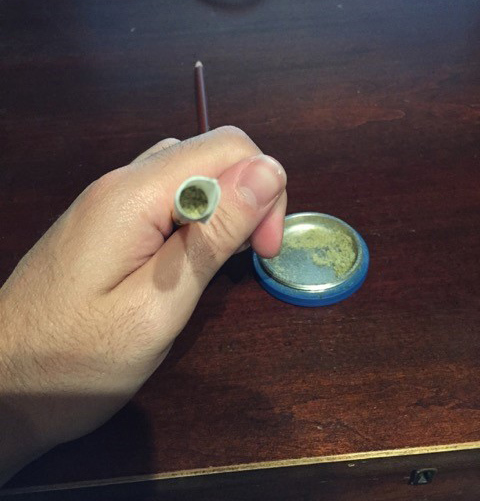 Tip: Joint wax can be applied as a faint adhesive to the inside of the tip after being heated with a torch, to keep it in place during use. Tip #1: Be careful not to overheat the tip as excessive heating can cause cracking. Tip #2: Hold the nectar collector horizontally while heating to avoid leaks. Tip: The nectar collector titanium tip allows you to use just the amount of dabs needed for your hit, so don’t waste your supply! Step 7: Don’t Forget to Exhale! Besides the titanium tip and glass mouthpiece, this nectar collector kit features a wax dish for storing dabs in between hits.The nectar collector itself, is 6 inches in length and has a 10mm sized titanium nail. The design is sleek and clean in appearance, and is made with durable borosilicate glass, which is known for it’s high resistance to extreme heat. The only downside to using this piece is the fact that it doesn’t come with a rotating metal swivel stand, as some of the more high end nectar collectors have, but that aside, this piece does it all. While using this device we experienced no issues during the assembly process and the hits were very clean and filtered thanks to the mini percolator. We filled the water too high the first time, but it was an easy fix. All in all, this nectar collector gets the job done at a fraction of the price that you’d normally pay for your average nectar collector, and it makes for an ideal buy, especially if you’re into dabbing or simply want a cheap alternative to your every day dab rig. 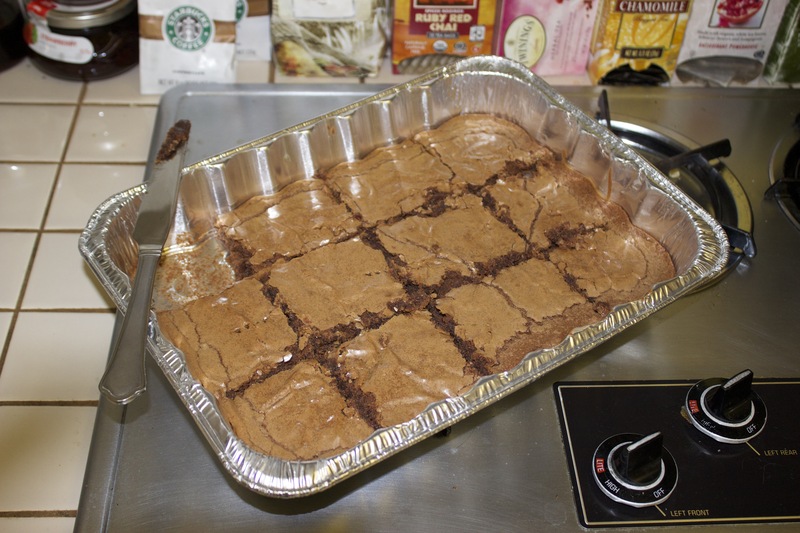 It’s always disappointing when your edibles don’t work and regardless of where they came from, the problem is usually that THC was not infused properly. 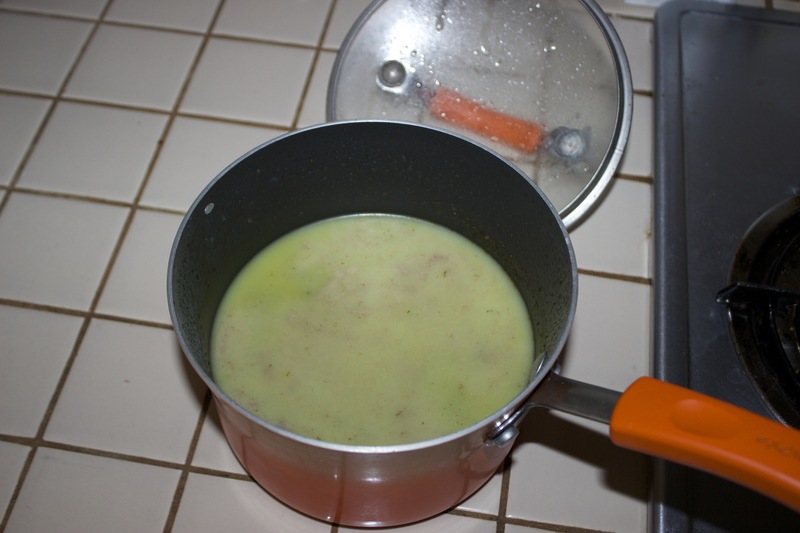 THC is a fat-soluble molecule meaning it can be dissolved into butter to form weed butter or cannabutter but many of the popular methods circulating on the internet contain serious procedural flaws that yield disappointing and unreliable results (most of which have to do with temperature control). Fill your pot about half full of water and bring it to a boil. While that’s heating up, grind up the weed to maximize the surface area that will come in contact with the butter (this will increase the efficiency of our extraction). 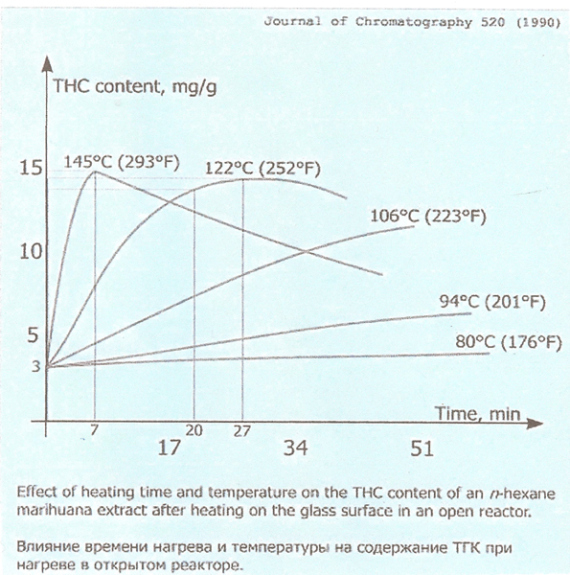 as you can see, too little heat leads to significant amounts of unactivated THC but too much heat for too much time causes a degradation to the overall THC content. Since a little decarboxylation will take place during the process of baking, the ideal cannabutter is not 100% decarboxylated.As both theoretical and experimental data suggests, it takes ~90 minutes to achieve optimal extraction and decarboxylation of the raw plant material. Step 4: Be Cool, Baby! 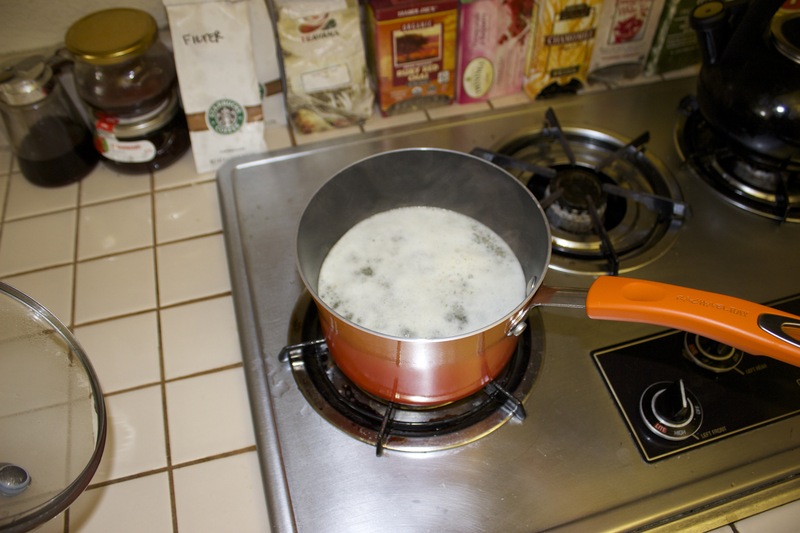 After you’ve boiled the water and butter and weed for 90 minutes, take it off the stove and let it cool off a bit before setting it in your fridge (you don’t want to heat your fridge up too much now!). You only have to leave it in for a few hours but I tend to leave it overnight. Some people prefer to pour the butter and water through a strainer or cheese-cloth into another container (to filter out some of the plant material)… but then this wouldn’t be a one-pot extraction would it? Besides, who needs another mess to clean up? Once the pot is chilled you’ll now have a beautiful green disk of cannabutter floating on top of the water with most of the plant material sitting on the bottom of the pot. Carefully remove the disk with a knife by cutting around the edges until you can lift it out of the pot. Don’t worry if it breaks into the pieces, they’ll just float on top of the water so you can fish them out with a fork or spoon. 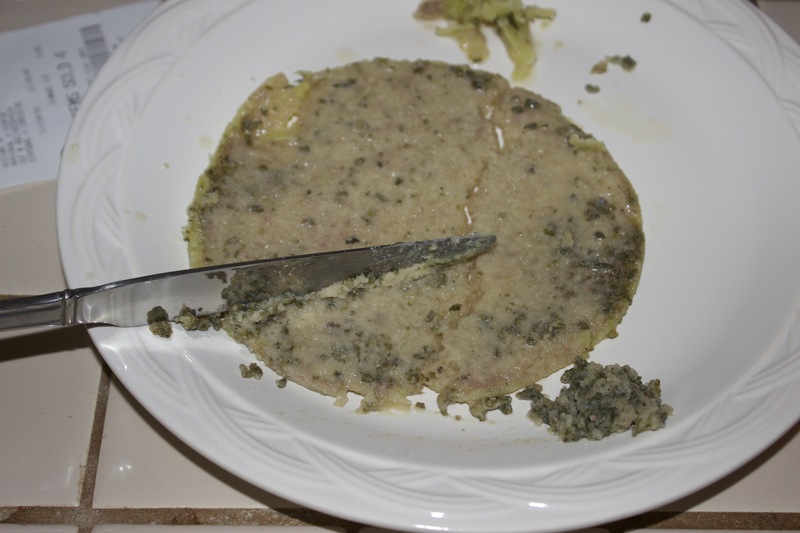 You’ll probably have some plant material stuck to the underside of your cannabutter disk– I just lightly scrape this off with a knife. I don’t go crazy about getting every little speck out because its not noticeable in the final baked product and sometimes… I’ll just leave it leafy to add a hint of earthiness and weediness to chocolate edibles (seriously! It’s pretty subtle). That’s it! 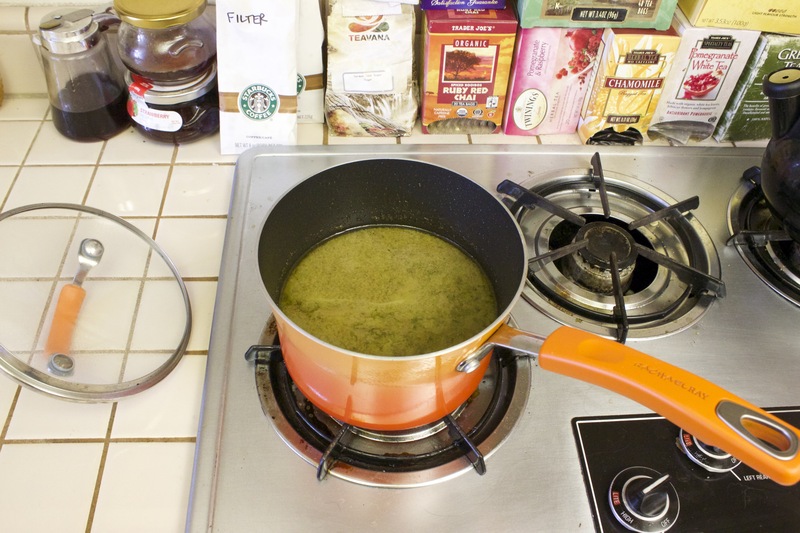 Substitute this cannabutter into your favorite recipes and see what you like! (pro tip: 1 stick of butter = 1/2 cup of shortening, make sure to mix everything really well or some bites will be stronger than others). Remember that internal baking temperatures are always much lower than what you set your oven at (cookies tend to reach internal temps of 200°F) so do not bake at a lower temperature in an attempt to avoid degrading the THC! If anything, baking at regular temperatures will help decarboxylate any remaining THCA into THC! I hope this method serves you well! No more ruining crock pots or sitting over a hot pan of oil just to get sub-standard results… 90 minutes with the lid on and stick it in the fridge– you’re done!